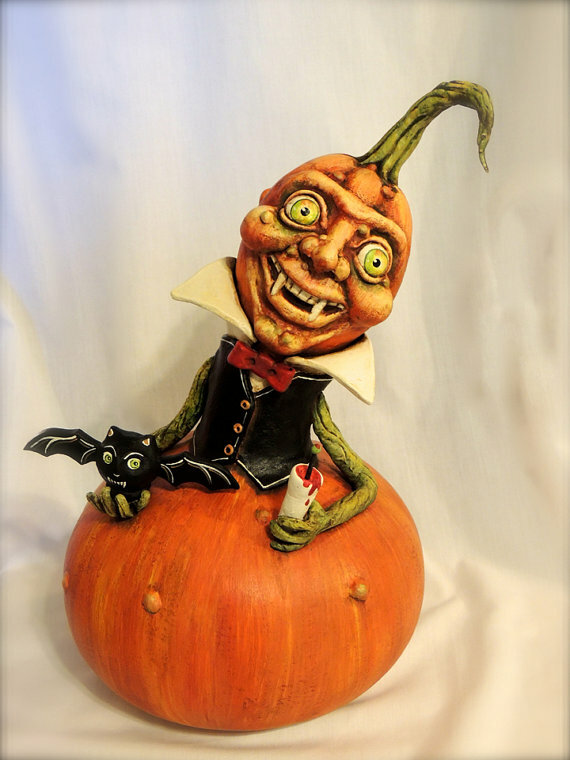 This is perhaps my favorite piece of Halloween folk art I’ve seen this year: the Gourd Vampire Pumpkin. Of course, the face is masterfully done…but I think the yellow-green eyes really MAKE this piece. Isn’t he hypnotic in the most perfectly insane way? This entry was posted on October 8, 2015 at 7:12 pm and is filed under craft, halloween, sculpture with tags craft, halloween, sculpture. You can follow any responses to this entry through the RSS 2.0 feed. You can leave a response, or trackback from your own site. Now THAT is a combination I have not seen!